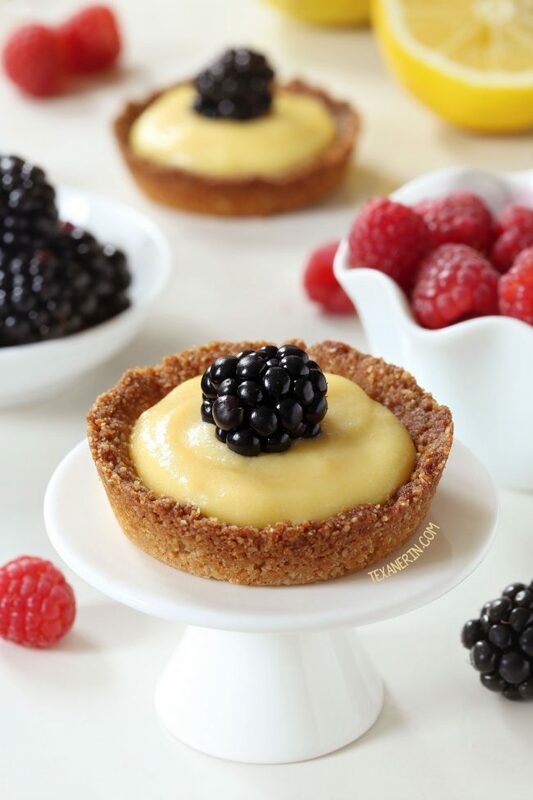 These paleo mini lemon tarts have an easy press-in crust and are totally honey-sweetened. You don’t see me posting too many pies or tarts around here. Chocolate cookie crusts I can do and love. But regular crust? I’m not a huge fan. And paleo crusts… ugh. What a nightmare! I think the issue is that I prefer sugar cookie-like crusts. With lots of white sugar. That doesn’t work for paleo so I’ve been fiddling with this recipe for waaay too long. Everything I tried was either too crumbly, soggy, totally lacking in flavor, or just plain bad. But I’m finally happy with this crust. I used honey in the crust and a little cinnamon to make it taste slightly reminiscent of a graham cracker crust. But please don’t make this expecting it to taste exactly like a regular graham cracker crust! You’ll be disappointed. If a paleo crust isn’t your thing, try this Gluten-free Lemon Tart from Fearless Dining for more of a traditional crust! For these mini lemon tarts, I also tried coconut crusts, macaroon crusts, regular crusts and lemony crusts. The lemon curd has such a strong lemon flavor that you couldn’t taste any flavor in the crusts. The crust recipe below was the exception! Make the curd. Mix together the eggs, honey, lemon zest and salt in a medium non-reactive (ceramic, stainless steel, or nonstick) saucepan or pot. Do not use any reactive (aluminum, copper, iron, and steel) utensils when making this recipe. This applies to any recipe with acidic ingredients. Heat over medium-low heat and once everything is well-combined, add the coconut oil or butter and continue stirring. Once melted, stir in the lemon juice. Cook the lemon curd over medium-low heat, stirring constantly, until it thickens – about 4-10 minutes. It's ready once the curd coats the back of a spoon and a clear path is left when you run your finger through it. Do not let the curd go over 170 °F (77 °C). Eggs scramble around 185 °F (85 °C) so be careful! Place a strainer or food mill over the storage container you want to store the curd in. Strain it and then let it cool completely and chill for at least 30 minutes before filling the tart shells. Prepare the tart crust. Preheat the oven to 350 °F (175 °C) and get out a 12-cup muffin pan. No need to grease it. In a medium mixing bowl, stir together the coconut oil, honey, cinnamon and salt. Add the almond flour and stir until well combined. The dough will be crumbly but should stick together when pinched. Divide the dough between the 12 molds (18 grams per cup) and press the dough over the bottom and only about 1/4 or 1/3 up the sides. Bake for 8-10 minutes or until lightly browned. Remove from the oven and run a knife around the sides of the tarts (this makes dislodging them later easier). Let sit for 10 minutes or until they've hardened and are easy to remove. They should pop right out with the help of a knife. Let cool completely and then place in the refrigerator for about 20-30 minutes or until firm. Fill with the cold lemon curd (4 teaspoons per cup) shortly before serving. I recommend only filling the crusts a few hours before serving to ensure that the crusts don't get soft. If you want to prepare the crusts ahead of time, don't let the crusts sit at room temperature very long before putting away in an airtight container (they get soft if you let them sit uncovered at room temperature). The lemon curd can be prepared 3 days ahead of serving and refrigerated. 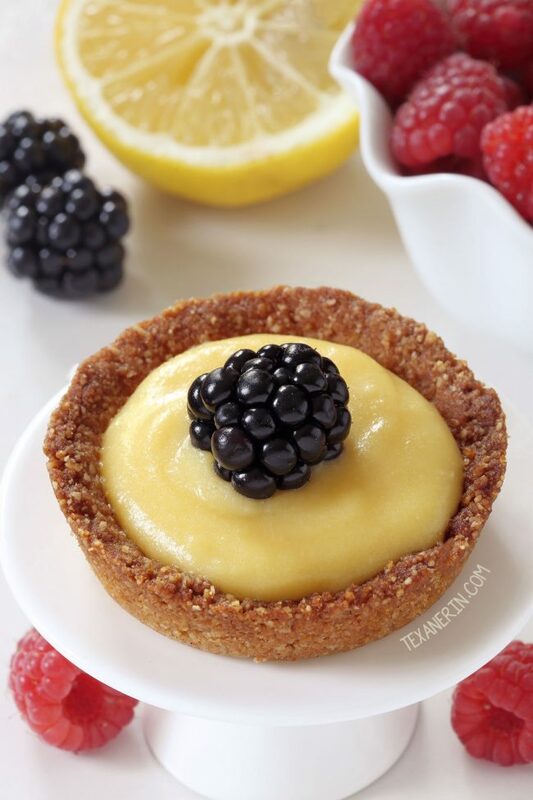 100 comments on “Paleo Mini Lemon Tarts (grain-free, gluten-free, dairy-free)” — Add one! I’m very sorry for just now seeing your question! I’ve never had a paleo pie crust that’s close to a regular pie crust (and that’s the only thing I haven’t been able to . I’ve tried probably over 100 and haven’t been in love with any of them. Sorry about that and sorry again for my slow reply! Hi there! I’ve been craving lemon tarts for a while and these look amazing. Only thing is I’m not very fond of honey. Do you think it would work if I use maple syrup instead or would that mess with the lemon flavour? Thanks! Hello! I’m so sorry for just now seeing your comment. I haven’t tried it but I think you’re right that it’d mess with the lemon flavor. Honey is also thicker than maple syrup, which also might affect it. I’m not too hopeful about it but I could be wrong! Are the crusts supposed to be served at room temperature? After cooling should I leave them out? Thanks. Sorry for just now seeing your question! Hopefully you found the answer in step 10. :) I recommend keeping them chilled. Hi Erin, have you tried ginger instead of cinnamon bases? I made them according to recipe. I did put them in cupcake liners and had no problems taking them out. Once baked, I let them cool for a few mins then stuck them in the freezer(to hurry the process up haha) then when I took them out i popped them out of their liners and came out perfect with the fluted edges. I found I had about maybe half cup of custard leftover. And I found the crust portioning part to be more like 22grams per crust(yes I did weight it out to 18g 😉) just wanted to include my notes for anyone that may find it helpful. Hi! These look amazing! 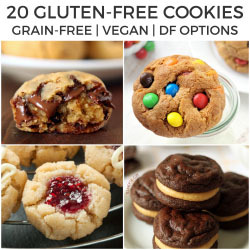 Can you use unrefined coconut oil in this recipe as well as your paleo lemon cookies? Hi there! Most definitely. :) Hope you’ll enjoy them! I’d love to hear how they come out. Unfortunately wheat isn’t interchangeable with nut flours. Sorry about that! You could use almond meal or another type of nut flour / meal. Wow!!! The recipe for these tarts looked good, but I was trying not to be too hopeful – paleo desserts are limited! These are the real deal. They taste amazing!!!! I love lemon curd. Always have. Have had to move to paleo for health reasons and I thought I’d give these a go thinking “they might be okay”. They far exceeded my expectations – the curd is DELICIOUS! Thank you Erin. Amazing. You’re welcome! Hope you’ll enjoy them. Thanks for pinning! This looks good! I’m excited to try the crust! I love graham crackers so an alternative will be nice. Thanks for sharing! I am excited to try this. I love the Paleo mini sweet treats! I haven’t tried it so I’m not positive. I think it’d probably work with 3 tablespoons + 1 teaspoon butter but it’s just a guess. I hope you’ll enjoy them! I used this crust for a df gf key lime pie. I made it in a 8 x8 glass baking dish and baked it with the filling on top for 25 minutes. My company really enjoyed it. Will make again. Awesome! So happy that it worked out well. Thanks for sharing how you made it in an 8×8! I’ll probably try that myself. :) Thanks again! I was short on almond flour and had about 7/8 of a cup. I added about 2 tbsp of coconut flour to the dough mixture and baked up 10 instead of 12 in the cupcake pan. Turned out to be a really tasty base, a bit less granular than the original recipe – and the final product held together much more firmly as well. Looks wonderful. My muffin pan is a bit dodgy-what do you think of using paper liners? I would remove them right before filling the crusts. Also thought the liner would create a fluted, tart-like edge. Hi there! Sorry but I’ve never tried it or actually used it in any recipe so I have no idea. Sorry about that! 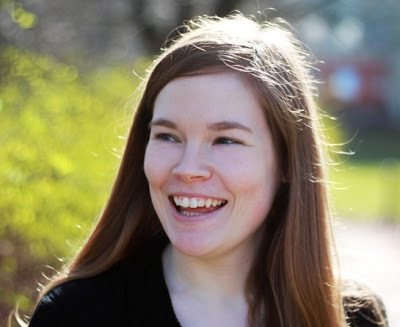 If you try it out, anyway, I’d love to hear how it goes! Awesome! That’s great. :) Thanks for letting me know! Hi angel, I really want to make this but almond flour is so expensive where I live… so, I was wondering: is it possible to use sunflower seed flour? like, putting the seeds on the food processor and grinding them… thanks! pics are amazing! Thanks! I’m happy you like the pictures. :) I’ve never used sunflower seed flour in anything so I unfortunately have no idea. I know that other people use it as a sub for almond flour but since I haven’t tried it myself, I really can’t say. Sorry about that! Can i use bobs red mill almond flour? I find almond flour a little heavy to digest, does this have a light texture? Loved the lemon curd but my tarts crumbled when I lifted them out after 10 mins . Followed all instructions …any ideas ??? As flavours so good . It is going to sound weird- but I needed a crust “cookie” and successfully used your crust to create that. After mixing, I took a good handful, smashed it into a ball-ish shape, then pressed and formed them into circles on a parchment lined cookie sheet, sprayed lightly with coconut oil. I baked as instructed and let cool. They are soft cookies and perfect to stick in my lemon merengue parfaits. I got 6 cookies out of a single crust batch. I might try smaller version in the future and adjust the baking time. It doesn’t sound weird! It sounds fantastic. :) Thanks for the tip! I’ll have to give that a try because it sounds great. Thanks a ton for your comment. what did you use for tart molds? I used a 12-cup muffin pan. Thank you. Regular size muffin tins or mini ones? I used a standard-sized 12-cup muffin pan. You could refrigerate or leave them at room temp. If you want to prepare the crusts ahead of time, don’t let the crusts sit at room temperature very long before putting away in an airtight container (they get soft if you let them sit uncovered at room temperature). But you still need to chill for about 30 minutes before filling so that the crusts firm up. Hope you’ll enjoy them! Hi Erin! This recipe looks great but I wanted to know if I could sub the coconut oil with butter in the crust. Thank you! Hi Karen! I haven’t tried it so I’m not positive. I think it’d probably work with 3 tablespoons + 1 teaspoon butter but it’s just a guess. I hope you’ll enjoy them! Would you recommend coconut flour instead? It’s all that’s available for me at the moment. Unfortunately, coconut flour’s not interchangeable with any other type of flour as it absorbs so much more liquid. Sorry about that! The only sub for almond flour is other nut flours. I want to make this crust, but as one tart not minis. What alterations do I need? Also, is this okay on a group who won’t notice it’s healthy?hehe thanks!! The curd recipe yields about 1 cup. I don’t think that’d be enough. Hi, I’m really looking forward to making these however I wanted to know if the tartlet cases can freeze? Looking to make the cases in advance and freeze them. I made these for a baby shower and they were so delicious!!! Thank you for the recipe. Im most likely going to make these often. Awesome! I’m so happy to hear that they came out well. :) Thanks a bunch for your feedback! Why can’t people just follow the GD directions?? You CHANGE THINGS AROUND…you change the outcome…c’mon!! I think the person below you, if that’s who you’re referring to, did follow directions (or maybe she didn’t – she didn’t answer my question about that!) and just added the butter after they fell apart in the oven. If you mean in general, then YES! Drives me crazy when people leave a bad rating on my recipes although they changed huge elements. hi…tried this out, and was very pleased with the curd itself! perfectly lemony with a touch of honey. As for the crust…it completely fell apart in the oven and didnt come out and crumbled. I tried crumbling it and mixing it with butter, but that failed. I’m happy the curd came out well! What do you mean that the crust fell apart in the oven? I’ve never had that happen with any crust recipe so I’m a little confused. Did you make any subs or changes at all to the recipe? And did you use a muffin pan for the crust or something else? Because if you try it using something other than a muffin pan, I can see there being issues with it. It looks so good! If I made a lemon pie with this crust do you think it would held ok during a week? Since you said one should fill the tart only before eating I wonder if it would be ok. I am unable to have nut flours or coconut due to allergies. Any other options? Would a gluten free graham cracker work for the crust? Looks heavenly!!! Wow! It sounds & looks like your persistence paid off with the crust! And lemon curd?? Yes please! I’m not sure if the lemon curd would freeze very well due to the eggs. I wrote that the lemon curd can be prepared 3 days in advance but I’m pretty sure 4 or even 5 days is fine. So I’d keep that and the crusts refrigerated (both in airtight containers) until the day of serving. :) I hope you’ll enjoy them! Being the lemon lover I am these are definitely going on the must try list!! You have WAY more patience than I do…haha. No way I could bake so many little tarts just to get it right. I wold probably give up – I’m the worst. However, I’m glad you were able to make it work because these look ahhhhhmazing! Love that shell looks crunchy and that lemon curd – perfection! Oh my gosh, I couldn’t imagine having to drag my baking stuff from the US back to Germany! What a pain! are the ingredients here just a ton different from there? Whoo wee and 100 mini tarts? You’ve got more will power than I do because I would have gone bonkers hahaha. Glad you finally got a crust that you’re happy with! I think it looks wonderful! That is what I call persistence! But it certainly looks like your hard work paid off. ;) These tarts look perfect! Oh boy these look to die for. I most certainly would devour 3 or 4 at least! These are adorable, I could eat a million of these. They’re small so that’s totally acceptable, am I right? I love that you conquered the crust, it looks like perfection. I can’t wait to try it. Mmmmm….love these little tarts, especially with that crust! I love how these look! It’s Mother’s Day this weekend in Australia and these will be perfect! Thank you! It’s Mother’s Day here, too, this weekend. :) Or at least in the US. I have no idea what’s going on in Germany. Haha. YUM!!! I am a lemon person too. I need to try this crust for the GF, DF family members. That’s real dedication! These look perfectly delicious! These look perfect!!! How the heck are you friend. I miss your face! I do the same thing with baking one at a time with tarts/cookies, etc!! I find I waste a lot less ingredients that way. Love these tarts and the honey added to the crust! Right?! I couldn’t imagine making full batches! I’d throw soooo much away. Looks like your hard work paid off. The crust looks perfect!